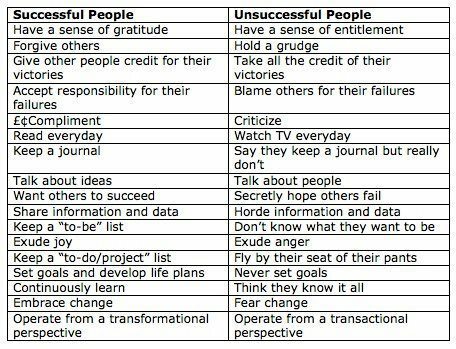 Lets talk about this for a sec, cause clearly I’ve been surrounded by alot of unsuccessful people lately SOOoooo… but this list is gonna apply to different people differently, the first one, people who have a sense of entitlement,always feeling as if the world owes them something, I take care of my kids so I deserve some sort of medal or special recognition, Negatory, there’s no special recognition for doing what you’re SUPPOSED to be doing in the first place, this goes for male and females, mamas and pappies. Secondly Forgiveness, this isn’t automatic, it actually takes an enormous amount of self growth and maturity to do this, I know because I still struggle with this and as a scorpio lawd knows I love to hold me a grudge hmph. Third, give credit where credit is due, especially WOMEN aw man we LOVEEEEE to tear each other down! get a grip. Next accepting responsibility for your failure. Playing the blame game is so easy, being able to say I effed up and im gonna do better takes some manning up. Complimenting vs. criticizing again my mind automatically races back to the female species, Always having something negative to say about the next chick says mountains about you, pay a compliment or two pay homage dammit lol. Now I don’t read everyday, some days but I do watch tv now whether that makes me successful or unsuccessful I’d have to disagree, yall know im not a fan of these reality shows real housewives of whatever county etc soo I’d have to say for those I do notice that revolve their entire lives and spare time to these type of shows living vicariously through celebs with issues who have no clue of your existence then yea I’d say the level of your success is diminished in some capacity. sue me. moving right along, keeping a journal, I just started, it’s actually quite liberating, im gonna share it with yall soon when I choose to soon lol. Talking about ideas vs. talking about people. I honestly am a firm believer in ” if they talk about people to you, then they’ll talk about you to other people” People are bored and instead of addressing their own personal issues and flaws they love to gossip about the next person. lmao @ enema YES, or if you’re not interested in what they’re doing you’re a hater, gotta love it!